Teeth are the name of the game here at Alligator Dental, and we like to cover every aspect of children’s dental health and oral hygiene. As we’ve talked about before, flossing is a crucial piece of quality dental care for kids, but it can be a challenge to establish flossing as a habitual part of a bedtime routine, much less doing it voluntarily at other times. One of the biggest challenges comes from choosing the floss that is right for your youngster. They may only like a brand that is flavored like peppermint or be partial to the blue plastic flosser picks with the handles that make it easier to reach those further back chompers. 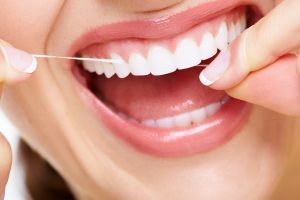 You may not think about it, but these different flossing options each have their own pros and cons that can make a large difference in long-term dental health. Today, we’ll take a quick look at the benefits and detriments in using regular floss and plastic flossers to help you make an informed decision for you and your little one. Fresh floss for each tooth: One of the first things we learn when it comes to flossing is to make sure to re-wrap and move along the string with each new tooth. This means you are not using the same strip of nylon for each of your children’s teeth. Much like a doctor putting on a new pair of gloves every time they see a new patient or touch a new tool, the fresh pieces of floss make sure you are getting a clean sweep for each tooth. Help you feel sensitivity and potential cavities: We all hate cavities, especially our children. No child wants to go in for a dental whitening only to discover they will have to get a filling for the tooth pain that won’t go away. Flossing with the right amount of pressure can help your youngster detect any tooth pain or potential cavities that brushing or chewing may not show on their own. Pain: Sure, it seems like a little bit of gum pain is a small price to pay for healthy teeth and gums, but floss is far more intense than you may realize. Because the gums are so sensitive, there is a threshold for how much pressure should be used. A little too much or an accidental slip, and you could jam some floss in between your teeth, causing bloody gums. Blood, swelling, and the occasional cut are all at risk for your youngster when they floss with traditional tools. Hard to use: We keep bringing this up, but even the pediatric dentists here at Alligator Dental know that floss is just kind of hard to use. Forcing your fingers to work around your teeth in the limited real estate that is in your mouth can only be trying. If it’s too difficult or just a nuisance to you, you aren’t alone, but try and stick with it, as traditional floss continues to be the ideal option. There are certainly more pros and cons for traditional dental floss than we have talked about here, but these are some of the most common you’ll hear at our children’s dentist practice. Easy to use: Unlike regular floss, plastic floss picks come with a handle, which means they are easy to use. You can use them with one hand, and your children will have a far easier time reaching those back molars. These also come in numerous shapes, which means that your style of flossing will be accommodated by the shape of pick you choose. Accessibility: After eating popcorn or a piece of meat, you may hear your little one mention that there’s something stuck in their teeth. A toothpick is an option, but those present the risk of splinters, choking, and other ailments you want to avoid. Instead, grabbing a flosser and giving your kiddo the chance to quickly dislodge the nuisance will be an all-around beneficial choice. Get dirty quick: Remember when we mentioned that normal floss gives you the ability to use a fresh spot of floss for each tooth? When it comes to plastic flossers, you are forced to utilize the same floss for each and every tooth, meaning they will get dirtier the longer you use them. Rigidity: The same plane of motion is required to use a flosser. Due to their plastic frames, plastic floss picks are rigid and don’t move like traditional floss will. This means you are forced to accommodate its range of motion, rather than having it adapt to your own, which can be inconvenient for those tricky spots and force you to jam the plastic end into your cheek. While both options of flossing have their pros and cons for your children, the important thing is to remind them that flossing is a crucial piece of their dental health. When it comes time for your kids’ next dentist visit, trust the professionals here at Alligator Dental. Whether they need a teeth cleaning, are suffering from a cavity, or have some other dental work they need done, we look forward to working with your children and teaching them to love their teeth. We are San Marcos and Seguin’s most trusted pediatric dental center and we can’t wait to see you, so give us a call and set up an appointment today!